Many antique wrist and pocket watches have been relegated to the sock drawer or the family curio cabinet based on significant case wear alone. After many years of faithfu service, a wristwatch case back and case lugs can degrade to a point where an otherwise fine timekeeper is no longer able to be safely worn and enjoyed. If you're visiting this page you're most likely familiar with these scenarios and have unsuccessfully attempted to find a craftsman to undertake these repairs. 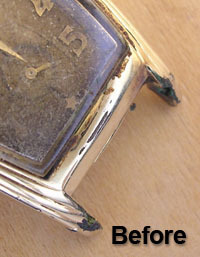 Only a few years ago and before the advent of the micro-laser gold fusing technology, such case repairs, especially on gold plated and gold filled watch cases - were nearly impossible to perform due to the risky necessity of heating an entire bi-metallic case with a torch to conduct these repairs. Cold solid-gold laser fusing is the long awaited answer which we are proud to offer as part of our guaranteed mechanical watch repair services. In an continued effort to provide our valued customers the highest level and most thorough range of watch repair services available, we are thrilled to now offer state-of-the-art watch before ability to make complicated and significant case repairs that before now were simply impossible. 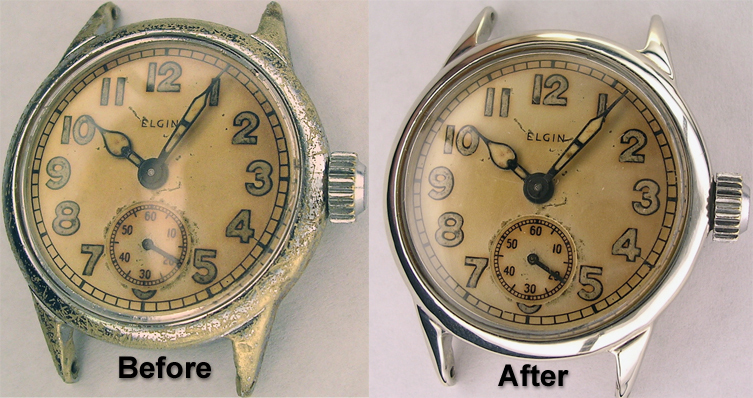 Our watch case repair services are offered as an additional service of an overall restoration of your timepiece. It's common that such case repairs require the removal of your watches movement as to smartly undertake the repairs often from inside the case. Any such handling of the movement or partial disassembly of a watch for case repair services, necessitates that I become fully responsible for it's performance and condition, inside and out. Additionally, watches that have sat unused for years based on having case problems should be serviced before put back into daily use. 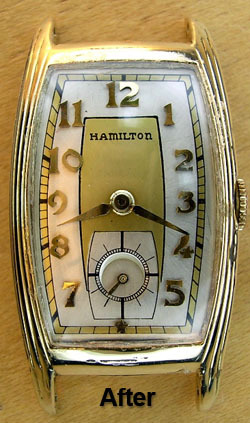 Each and every wristwatch and pocket watch is unique in it's needs and thus will demand varying levels of case repair. We match the karat color of every case and use only solid gold to make all case repairs on gold plated watches, gold filled watches and solid gold watches. Our procedure is tested, exacting and of the highest quality. As is the case with the repair of any item, cost is normally determined by how much time, labor and material is needed to successfully complete a repair. As a rule of thumb, a normal repair of a worn away case lug repair runs around $50 each. Less, if it's a superficial repair, more if the case lug is significantly deep and needs more gold. It's not uncommon that a case that in need of extraordinary effort and material (solid gold) can run up to $300. Turn around time for the completion of case repair work as part of an overall restoration is typically under four weeks. If you'd like for me to pass along a close estimate of expected costs associated to the repair of your watch case, feel free to send me a close focus photograph (jpg). A clear photo and a detailed explanation of deficiencies, will allow me to pass along a thoughtful estimate. Should you want me to examine your watch case for possible repair as part of it's overall servicing, I'd be most glad to pass along a very close estimate from this hands on examination. No case repairs will be executed without your thorough understanding and consent. 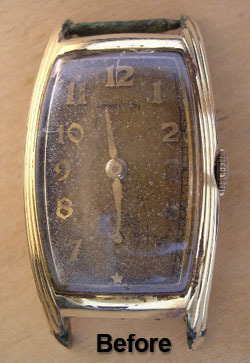 Again, every damaged case has unique repairative needs and I look forward to working with you to determine the feasibility and anticipated expense of your heirloom watches case repair. With all of my services, I promise prompt, clear and informative communication and strive to offer the most exacting repair services available the world over. Please visit my Wrist Watch and Pocket Watch Service link and compare the known needs and characteristics of your watch to the list of services provided for a good idea of expected servicing costs. Contact me with the description of your watch, it's current performance, know repair history and any glaring abnormalities – along with a photo (if possible) of the case that is in need of repair. I'll be glad to pass along my thoughts along with a close estimate of expected restoration costs. Please refrain from sending me any watch without my authorization. Upon my our mutual acceptance of terms, then please review my Shipping Instructions link for a detailed look at the safe and exacting shipping process that we will use to ship your watch – and upon it's completion, safely return it to you. Naturally, feel free to pass along any questions about your watch and it's needs, I'll be most glad to respond promptly and in full. This new technology allows for the repair of watch cases previously impossible. We match the color of our solid gold repairs to the case color of your watch. Solid gold is laser fused and layered into the pitted, worn and broken areas of your case allowing for years of proud use of your heirloom timepiece. The mechanical wristwatch seen below, was made in the late 1930's arrived in very ruff shape. It's case was so damaged that no strap would attach to the case. It's movement, dial, and crysta needed a full restoration. As you can see, it turned out very well. There is no aspect of the restoration of these marvelous contraptions that we can't successfully undertake. We look forward to pleasing you with our craft and dedicated customer service.